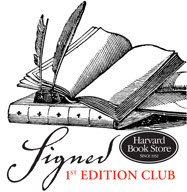 Harvard Book Store welcomes award-winning author CHLOE BENJAMIN for a discussion of her latest novel, The Immortalists. She will be joined in conversation by award-winning broadcast journalist CALLIE CROSSLEY. Callie Crossley is the host of Under the Radar with Callie Crossley on WGBH. She is also a public speaker and television and radio commentator for national and local programs, including CNN’s Reliable Sources, the PBS NewsHour and PRI’s The Takeaway. She also appears on WGBH­TV’s Beat the Press, examining local and national media coverage; Basic Black, focusing on current events concerning communities of color; and Fox 25 Boston’s Morning Show. Crossley has earned an Oscar nomination and a National Emmy in addition to many other awards for her work in radio.